Time has been on our side and we got the new showcase moved to the North Car . We wanted to do something different and while we were deciding what to put in the showcase. The answers came via email and the postal service. The email was an update letting me know the Amtrak National timetable would not be printed anymore. I sure hated to hear that but do get the thoughts of more people downloading them. Then the next day a donation came in the mail. It was Amtrak buttons. Guess what is in the showcase?? Timetables and Buttons!!! The showcase looks great under the 40th Anniversary storyboards. 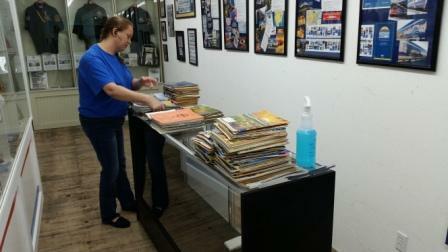 Here is Amy sorting some of the timetables. 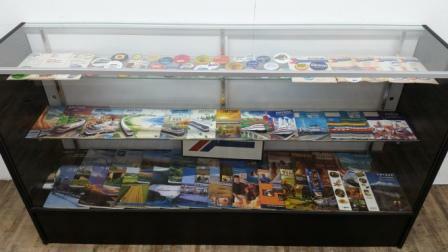 As always the keys to the Exhibition of Amtrak History are available at the front desk of the Depot Inn. So when you are in town please take some time to check out this one of a kind exhibit.